So I wake up early on Saturday. I cant sleep because of the game tonight. I am having lunch with a friend down at Chelios’ chili bar in Dearborn at noon. I figure Ill head to the arena about 5:30. I get down to the statue and there are about 4 photographers and me + 3 folks from the banner company getting ready to put the Jersey on. I hang out and watch and more folks show up. I got interviewed by the Detroit Free Press, The Detroit News, and WWJ the big news talk station here. I hang out for a couple of hours and watch the dress the guy then head to Cheilis’ MMMMMmmmm boy that is good chili! I heard myself on WWJ on the way home! 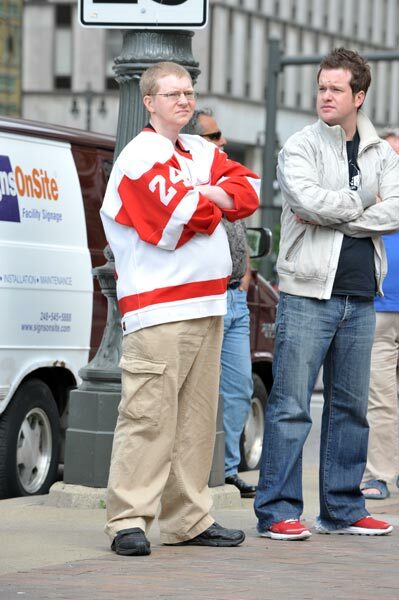 John Gay, 39, of Stone Mountain, Ga., and Michael Spellman, 30, of Los Angeles watch the jersey installation. Both men have tickets for the Stanley Cup Finals.